Here at Living Generously, we focus on turning your knowledge of what you should do into habit. You can stop wishing your were healthy in body, mind, and spirit. You can stop hoping you’ll make the world a better place. When you practice the 7 Fundamental Habits, taking care of yourself and others becomes part of the fabric of your being. You don’t have to think about it. So far we have discussed Physical Health (Habit 1) and Mindfulness (Habit 2). Habit 3 is all about Connecting With Others, because there’s only one way to make the world a better place: you have to make an impact on others. The hermit isolated in a mountain retreat doesn’t make the world a better place. But if he wrote some inspirational works that were later released that inspired people to live better lives, at that point he made the world a better place. It’s not until others are involved, that an impact is made. Make no mistake. While Connecting with Others is good for them, it’s also good for you. Social isolation is a better indicator for mortality than being overweight, smoking, or having high blood pressure. Additionally, people who lack a strong sense of connection to others also are more vulnerable to anxiety, depression, antisocial behavior, and even suicidal behaviors, and in a negative feedback loop, those behaviors tend to reinforce and increase their isolation from others. The opposite of being socially isolated is being socially connected, and the effects of social connection are opposite of the effects of social isolation. Where social isolation is associated with a higher mortality rate, strong social connection is associated with a 50% increased chance of longevity. Instead of being vulnerable to mood disorders, people who report feeling strong connections with others also report lower rates of anxiety and depression. Instead, they have higher self-esteem, are more empathic to others, more trusting and cooperative, and in a positive feedback loop, those behaviors reinforce their connections with others. Connection is a two way street. In order for you to feel connected, you must feel seen, heard, and valued. In order for someone to feel connected to you, you must see them, hear them, value them. Clearly, this type of connection doesn’t happen after one or two interactions. It takes time and repeated positive experiences, which why it’s important to making Connecting With Others a habit by taking small actions every day that help connect you with other people. If you’re a co-dependent or an introvert, you may be worried right now. But I promise you that it is possible to give to others in a way that is healthy and in a way that you will enjoy. 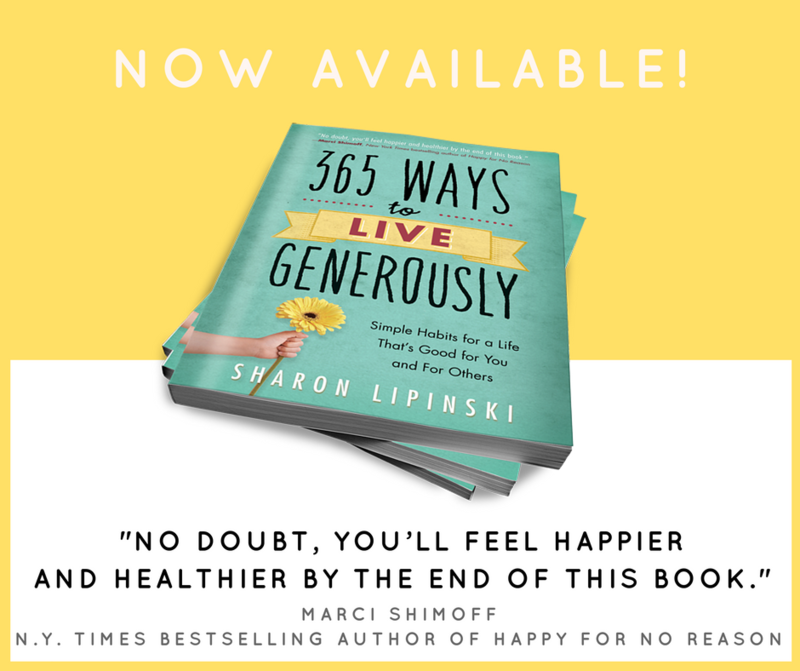 As we begin a life of living generously, it’s important to take a moment to talk about boundaries, because sometimes you can be too generous or generous in the wrong ways or to the wrong people. As a result, you can be taken advantage of or get involved in situations that are unhealthy. You may even be doing these things now. If you feel like you have to “save” people, if you get sucked into drama, if you swing between loving and hating your friends or lovers, then you probably already have boundaries issues. Poor boundaries result from misunderstanding who is responsible for what. The other person is responsible for their actions, their emotions, their responses to their situation, their happiness or lack there of. And if you feel responsible for those things, you end up doing things for people that not only they should do for themselves but things that only they can do for themselves. While you can provide guidance, inspiration, and some tools, you are not respecting them when you disregard their personal responsibility. And very likely, you are not even doing these things for them. It’s about you. It’s YOUR need to be loved or admired driving your so called generous actions. Boundaries work both ways. You are responsible for your actions, your emotions, your responses to your situation, and your happiness or lack there of. When you expect other people to do certain things for you, to act towards you in certain ways, or to make you feel loved or happy, you place control of your life in someone else’s hands. You need them, and your neediness gives them power over your life. Unfortunately, they can’t fix you any more than you can fix them. Fundamentally, healthy boundaries are a result of healthy self-esteem. When you respect yourself, you take care of your physical, emotional, spiritual health. You don’t surrender responsibility for your well-being. You don’t look outside yourself for only things you can give yourself. And you want other people to have self-respect, so you give them the courtesy of taking responsibility for their lives, too. I’m an introvert. Sometimes I think that if I never left my house again, I’d be ok with that, because my house is the most beautiful and comfortable place in the world to me. I love being home. I love reading. I love being thoughtful and exploring all the details and improving myself. I love hanging out with a few people that I know really well. But I don’t always enjoy sharing my emotions with others and I tend to be more reserved around large groups of people. Can you relate? If so, you might be an introvert like me, and the focus on giving to others might make you a little nervous. As someone who used to be painfully shy, I understand, and I assure you that even as an introvert, connecting with others is not only possible, it’s necessary. You just have to discover HOW to connect in a way that fits your personality. Shyness and introversion are often confused, but they are completely different. Shyness is about fear. It’s feeling tense or uncomfortable in social situations because it’s not safe to be yourself or express your opinion. But introversion and extroversion are personality traits. Introverts are more internally directed while extroverts are externally directed. Both introverts and extroverts can suffer from shyness. Here are a few strategies you can use to turn your introversion into a powerful tool for social connection. As an introvert, you will always need to recharge, so take the alone time you need to calm, center, and energize yourself. The small act of focusing on your breath while walking into an event (i.e. a walking meditation) might make a huge difference for you. you feel more confident when you are prepared, so embrace it. Prepare a few ice breakers, find out a little about the other attendees, learn a little about the history of the event or topic, write out your argument for a new strategy at work before presenting it at the office meeting. Before a social event, stand in a confident posture and repeat a mantra like, “You’re good enough, smart enough, and gosh darn’t, people like you”.
. This is what you do best, and this is wonderful, because you know what people LOVE to do? Talk about themselves! Brilliant. Easy. As introverts, we can get overwhelmed, so focus on a few areas where you want to be social. An extrovert may love being involved in 10 different charities, but maybe you want to choose 1 or 2 that you care a lot about. Or focus on 1 or 2 different social events like the Chamber of Commerce’s Business After Hours and your industry’s professional organization. Then give yourself permission to say no to the 100 other networking opportunities available to you. It’s ok to be scared and awkward. It’s ok to try something new and not be very good at it. Show up anyway. The more comfortable you are with being uncomfortable, the more comfortable you’ll become. All right, so that’s the third habit. And there is only one way to make it a habit, you gotta do it. Who in your life would you like to strengthen your connection with? What is already good about your relationship with that person? In what ways do they draw sustenance strength from you? What action will you take to communicate to this person that they are seen, heard, and valued? I’d love to hear from you about your experience with connecting with others.